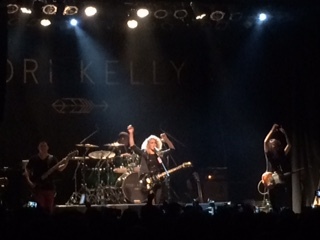 Last night I had the awesome privilege of attending the Tori Kelly concert at the Phoenix Concert Theatre. I have been following Tori from a couple years ago when she started posting covers on YouTube. The best way I can describe her voice…”water”, her voice literally sounds like water with the way she just flawlessly flows up and down through her runs and to this day I have not heard her sing a wrong note. Her concert was EVERYTHING and more, she sung material off of her new album, oldies like Lauryn Hill, and some of the covers that got her noticed by the general public. I really like her because she is so down to earth, loves God, and has REAL talent. Even though she makes me want to throw away my guitar and quit music all together because her voice is INSANE and mine just doesn’t compare, but she also inspires me to keep playing/practicing my guitar and making music that I love and not to conform to the sounds of what is “hot” right now. Do what you love. I decided to put away the wigs and weaves for a while and just wear my natural hair. It’s been a year and a half since I went natural and I love how my hair has progressed, it is still not my ideal length but it’s getting there. I feel like I’m apart of the Black Panther movement when I wear my hair like this…embrace the fro! Unfortunately, there is still no sight of summer anywhere seeing as I am still wearing long sleeves and a leather jacket but I had to wear shorts just to remind the weather that some of us would like to wear more of them.